Varicose veins are dilated, tortuous, elongated superficial veins that appear most often in the legs. Varicose veins, also called varicosities, are seen most often in the legs, although they can be found in other parts of the body. Most often, they appear as lumpy, winding vessels just below the surface of the skin. There are three types of veins: superficial veins that are just beneath the surface of the skin; deep veins that are large blood vessels found deep inside the muscles; and perforator veins that connect the superficial veins to the deep veins. The superficial veins are the blood vessels most often affected by this condition and are the veins that are visible when the varicose condition has developed. The inside walls of veins have valves that open and close in response to the blood flow. When the left ventricle of the heart pushes blood out into the aorta, it produces the high pressure pulse of the heartbeat and pushes blood throughout the body. Between heartbeats, there is a period of low blood pressure. During this period blood in the veins is affected by gravity and wants to flow downward. The valves in the veins prevent this from happening. Varicose veins start when one or more valves fail to close. The blood pressure in that section of vein increases, causing additional valves to fail. This allows blood to pool and stretch the veins, further weakening the walls of the veins. The walls of the affected veins lose their elasticity in response to increased blood pressure. As the vessels weaken, more and more valves are unable to close properly. The veins become larger and wider over time and begin to appear as lumpy, winding chains underneath the skin. Varicosities can also develop in the deep veins. Varicose veins in the superficial veins are called primary varicosities, while varicose veins in the deep veins are called secondary varicosities. Varicose veins have a number of different causes; lifestyle and hormonal factors play a role. Some families seem to have a higher incidence of varicose veins, indicating that there may be a genetic component to this disease. Varicose veins are progressive; as one section of a vein weakens, it causes increased pressure on adjacent sections of the vein. These sections often develop varicosities. Varicose veins can appear following pregnancy, thrombophlebitis, congenital blood vessel weakness, or obesity, but they are not limited to these conditions. Edema of the surrounding tissue, ankles, and calves is not usually a complication of primary (superficial) varicose veins. When edema develops, it usually indicates that the deep veins may have varicosities or clots. Varicose veins are a common problem. More than 80 million Americans experience the symptoms and complications of varicose veins, including 10%–15% of men and 20%–25% of women. The symptoms can include aching, pain, itchiness, or burning sensations, especially when standing. In some cases, with chronically bad veins, there may be a brownish discoloration of the skin or ulcers (open sores) near the ankles. A condition that is frequently associated with varicose veins is spider-burst veins. Spider-burst veins are very small veins that are enlarged. They may be caused by back-pressure from varicose veins, but can be caused by other factors. They are frequently associated with pregnancy and there may be hormonal factors associated with their development. They are primarily of cosmetic concern and do not present any medical concerns. Varicose veins can usually be seen. In cases where varicose veins are suspected, a physician may frequently detect them by palpation (pressing with the fingers). The physician will examine the veins while the patient is first in a standing position and a second time while the patient is lying down. X rays or ultrasound tests can detect varicose veins in the deep and perforator veins and rule out blood clots in the deep veins. A handheld Doppler instrument is now the preferred diagnostic tool for evaluating the leg veins. There is no cure for varicose veins. Treatment falls into two classes: relief of symptoms and removal of the affected veins. Symptom relief includes such measures as wearing support stockings, which compress the veins and hold them in place. This pressure keeps the veins from stretching and limits pain. Other measures include sitting down, using a footstool to support the feet when sitting, avoid standing for long periods of time, and raising the legs whenever possible. 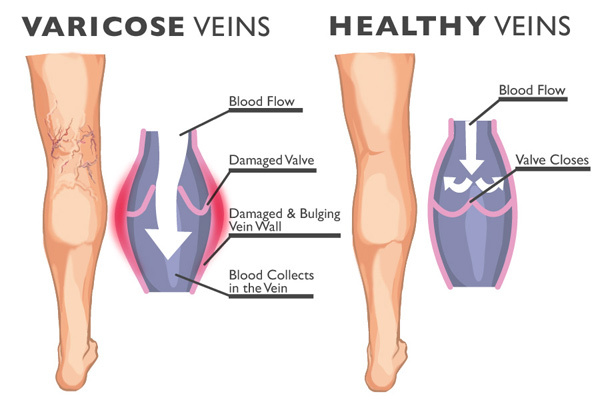 These measures work by reducing the blood pressure in leg veins. Prolonged standing allows the blood to collect under high pressure in the varicose veins. Exercise such as walking, biking, and swimming, is beneficial. When the legs are active, the leg muscles help pump the blood in the veins. This limits the amount of blood that collects in the varicose veins and reduces some of the symptoms but does not stop the disease. Herbal therapy can be helpful in the treatment of varicose veins. Essential oils of cypress and geranium or extracts from horse chestnut seeds (Aesculus hippocastanum) are massaged into the legs, stroking upwards toward the heart. Application to broken skin and massage directly on the varicose veins should be avoided. Horse chestnut may also be taken orally and biothavenoids are used to increase vascular stability. In late 2001 a new product derived from aescinate, a chemical found in horse chestnut, was approved by the Food and Drug Administration (FDA) for topical use in the treatment of varicose and spider veins. The new product, sold under the name of Essaven gel, reduces edema. It can be applied underneath support hosiery if desired. Drinking fresh fruit juices, particularly those of dark colored berries (cherries, blackberries, and blueberries) can help tone and strengthen the vein walls. The enzyme bromelain, found in pineapple juice, can aid in the prevention of blood clots associated with the pooling of blood in the legs. Deep breathing exercises performed while lying down with the legs elevated can assist gravity in circulating blood from the legs. The flow of fresh blood into the legs can help relieve any pain. Surgery can be used to remove varicose veins from the body. It is recommended for varicose veins that are causing pain or are very unsightly, and when hemorrhaging or recurrent thrombosis appear. Surgery involves making an incision through the skin at both ends of the section of vein being removed. A flexible wire is inserted through one end and extended to the other. The wire is then withdrawn, pulling the vein out with it. This is called “stripping” and is the most common method to remove superficial varicose veins. As long as the deeper veins are still functioning properly, a person can live without some of the superficial veins. Because of this, stripped varicose veins are not replaced. Injection therapy is an alternate therapy used to seal varicose veins. This prevents blood from entering the sealed sections of the vein. The veins remain in the body, but no longer carry blood. This procedure can be performed on an out-patient basis and does not require anesthesia. It is frequently used if people develop more varicose veins after surgery to remove the larger varicose veins and to seal spider-burst veins for people concerned about cosmetic appearance. Injection therapy is also called sclerotherapy. At one time, a method of injection therapy was used that did not have a good success rate. Veins did not seal properly and blood clots formed. Modern injection therapy is improved and has a much higher success rate. Two new allopathic treatments have been developed since 1999 that are much less invasive than stripping the veins. One is called radio frequency closure, or the closure technique. In radio frequency closure, the surgeon inserts a catheter into the varicose vein through a small puncture. The catheter is used to deliver radio frequency energy to the wall of the vein, which causes the vein to contract and seal itself shut. The nearby veins then take over the flow of venous blood from the legs. The second new treatment is called the endovascular laser procedure. The doctor uses a diode laser wire or fiber that is inserted directly into the vein. Energy transmitted from a laser heats the varicose vein and seals it shut. The patient can go back to work the next day, although a support stocking must be worn for two weeks after the laser procedure. Untreated varicose veins become increasingly large and more obvious with time. Surgical stripping of varicose veins is successful for most patients. Most do not develop new, large varicose veins following surgery. Surgery does not decrease a person’s tendency to develop varicose veins. Varicose veins may develop in other locations after stripping. While genetic factors play a significant role in the development of varicose veins, swimming and other exercises to increase circulation in the legs help to prevent varicose veins. Preventive measures are especially important during pregnancy, when the additional weight of the fetus and placenta can exert pressure on the mother’s legs and feet.